The History of Mingary Castle has been written about at length but the origins and date of the Curtain wall defences are still based on conjecture, as being in some part of the 13th Century and to some commentators either the 12th Century or the early 14th Century. Its dominant position, offering protected cover for the Sheltered anchorage of the harbour of Kilchoan, thus assuring access to the Western Isles shipping lanes, makes Mingary a perfect spot as a base for the “Sea Kings”, who were effectively Overlords and privateers. 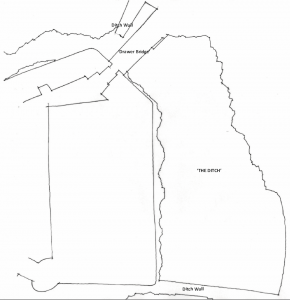 The establishment of a base at Mingary most likely predates the stone curtain wall, Archaeological investigation at the nearby and similar Castle Tioram has revealed remains dating back to the 7th Century. Therefore, it is likely that a robust timber palisade was erected on this site and was probably repaired and replaced prior to the establishment of the Stone Castle. It is highly likely that there were timber fortifications at Mingary from the middle of the 12th Century either established by Somerled (a Regulus, or Jarl and progenitor of the MacDonalds) in the 1150s, after David the first of Scotland and Olaf of Mann died in 1153, leading to a power vacuum which Somerled took full advantage. 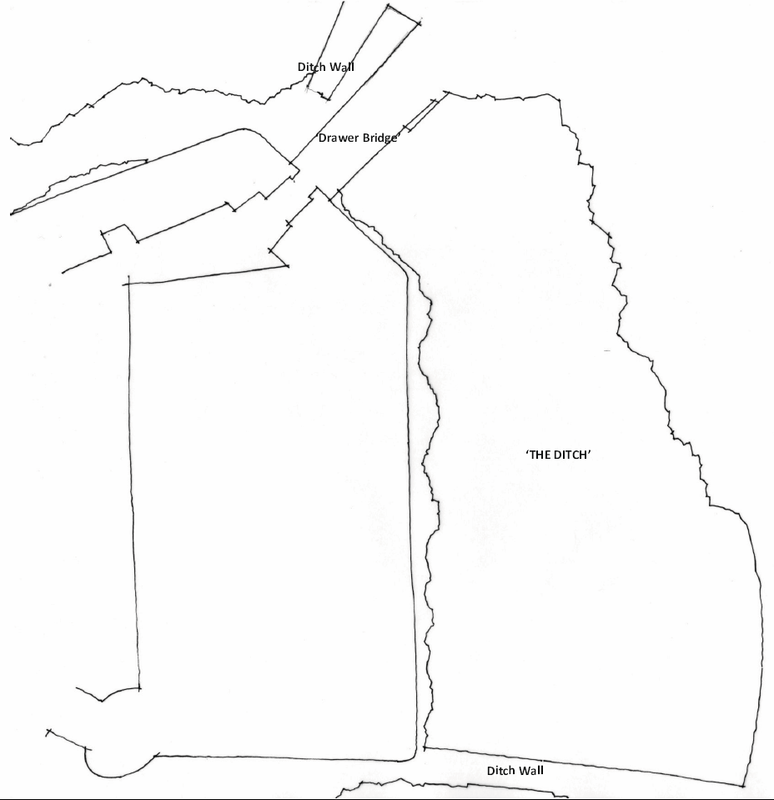 An alternative date for construction would be after the so called “Battle of Renfrew” ( An attack on the Stewart’s Territory) in 1164 in which Somerled was assassinated, murdered, or inconveniently died. Needless to say this lead to the fragmentation of Somerled’s army and to the disintegration of the estates amongst three competing family members. There were numerous Clan battles and the swearing of an oath to King John of England would also have necessitated sea and land protection from competing Clans. The Western Isles remained a separate Kingdom under Norse Overlords until the Battle of Largs in 1263 and the uneasy truce from the treaty of Perth in 1266 in which the then Lord Angus Mor MacDonald swore fidelity to Alexander the third of Scotland thus keeping his territories. Angus Mor died in 1296, so the intervening thirty years of uncertainty may have lead to the construction of a more permanent structure. 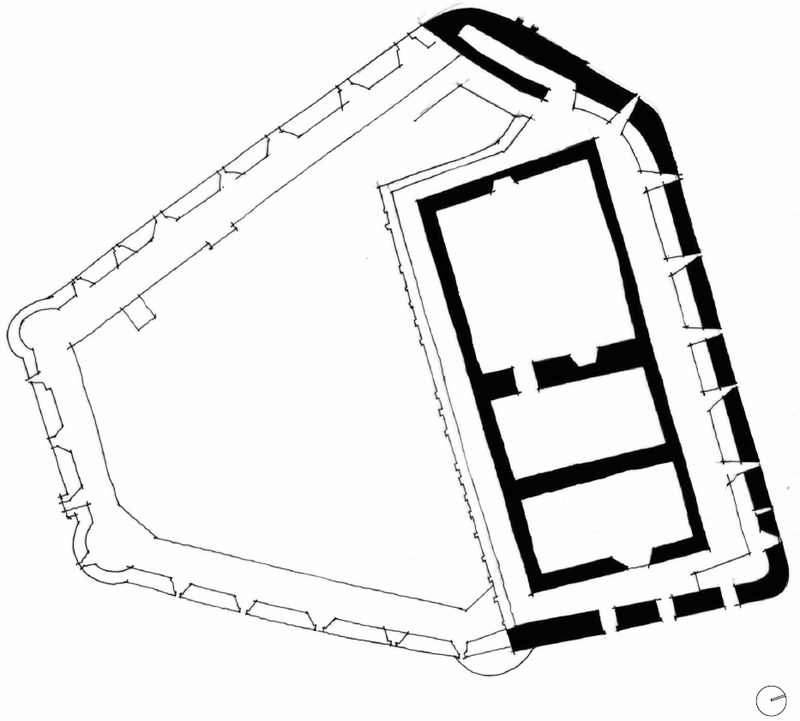 The method of construction – with internal galleries – would have taken a year or two to complete. The elegant but simple gothic head windows corsed into the walling are also unlikely to predate the 1270s. 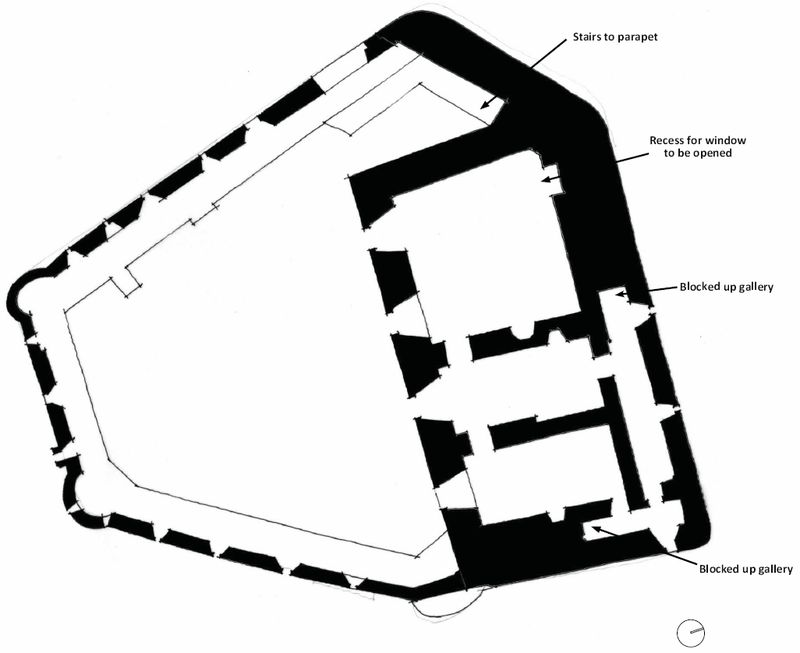 The twenty year period of instability after the death of Alexander III in 1286, ‘the short reign’ of the Margaret of Norway, the two Interregnums, and the ineffectual Balliol, would also have resulted in a need to create a more effective and modern fortification, especially with the aggressive intentions of Edward I of England. It is also possible that Mingary Castle was built by Angus 0g son of Angus Mor. Angus 0g supported Robert the Bruce and fought along side him at Bannockburn. The Bruce granted 0g extensive lands including Ardnamurchan however 0g was disappointed that he wasn’t granted lands in Kintyre, which went to The Bruce’s grandson later to be Robert II. Therefore, it is possible that between the ascendency of Bruce in 1306 and the energy and strategy leading up to Bannockburn in 1314 or in the relative stability before the Bruce’s death in 1329. These two periods would be more likely to provide the time and reason to build a series of Castles, including the nearby Castle Tioram. 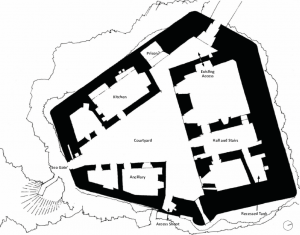 Clearly the periods of instability either by external forces from Norway, England, and the consolidation of the Scottish Crown as well as inter Clan disputes, would have created the need for a stronghold, but when this was formalised into a stone fortification is difficult to assert. By association Castle Tioram is thought to have been built at the same time by the same mason, the ‘Insu la Sicca’ as mentioned in a Charter of MacRuari (A descendent of Somerled) in 1320 listing possessions which were inherited by Amie MacRuari the first wife of John of Islay, Lord of the Isles. The mention of ‘The Dry Island’; Insula Sicca is thought to denote its importance as a fortified stronghold but this may refer to a palisaded structure and not masonry. Tradition has it that Amie ‘MacRuari’ MacDonald built Castle Tioram and Mingary after her marriage to John of Islay in 1337, inheriting the estates in 1346 after the murder of her brother. 1346 is a crucial date in Scottish politics, it is the date of the Battle of Neville Cross where the Scots were defeated by the Edward III. The Claimant to the Scottish throne Edward Balliol, having tried to establish himself again as King David the second of Scotland was imprisoned by Edward II. For John of Islay this was a difficult time he had originally backed Edward Balliol against David and when the insurrection was defeated swore allegiance to King David, so it is quite possible that in the four years between 1346 and 1350 before Amie MacDonald died that both Mingary Castle and Castle Tioram were built to protect the Isles from invasion. What we can be certain of is that Castle Tioram is mentioned in the Chronicle of John of Fordun c1380. Unfortunately Mingary is not, but with similarities and same ownership we can be confident that they were built at the same time. The period of uncertainty over the fate of King David remained until 1357 when he was ransomed back to Scotland and with that Edward Balliol was also persuaded to relinquish a claim. John lived until 1386 and was a consummate politician, but his early association with Balliol must have always rankled with King David. My view is that the period from 1346 is the most likely construction date. I believe, as expressed by Geoffrey Stell in his “Statement of Cultural Significance”, that a pre 1300 date is possible but less likely than a post 1346 date. The assumption of a pre 1300 date i.e. 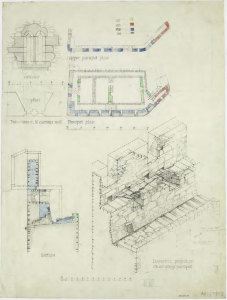 ‘First Period’ was asserted by MacGibbon and Ross in their seminal work “Castellated and Domestic Architecture” published between 1887-92. It is difficult to argue against this great and valuable work and indeed there can be no certainty in any theory as there is insufficient evidence, but when the Polyginal Enclosed Castles origins are researched, Historical events point towards later dates for construction. 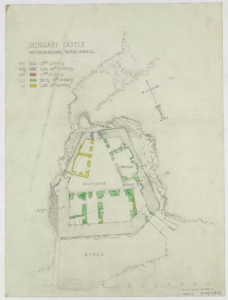 The Evolution of Mingary Castle is, however, relatively straight forward to date as construction phases relate to ownerships, sieges, and invasion. The next phase of major works is likely to have occurred in the early 16th Century. The “Lord of Isles” was forfeited after James the fourth’s punitive expedition to the Western Isles and shortly after in 1499 John MacDonald was granted his seat at Mingary and Ardnamurchan. Following the Death of King James at Flodden in 1513, hostilities broke out between John MacDonald ( The Maclain of Ardnamurchan) and Sir Donald MacDonald of Lochalsh whose father had been murdered by Maclain. Sir Donald laid siege to Mingary twice burning the Castle in 1515 and the surrounding lands. 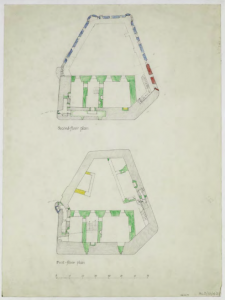 The Castle would obviously be repaired and strengthened after burning to repel siege attack and the reinforcements seem to have been effective, as hostilities continued through the century with most famously the Maclain’s and Maclean’s laying siege to Mingary with the support of an Armada Galleon. This was repelled with Clan support. The era of the MacDonald Clan’s supremacy came to an end with the Campbell’s expansionist policies; in 1612 the Archibald, Earl of Argyll, ordered the taking and holding of Mingary at his expense. 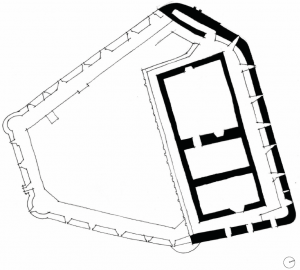 The Campbell’s then made major alterations to the crenelations; raising the levels, providing gun placements and adding corbelled bartizans. These reinforcements were clearly effective as the MacDonalds twice tried to lay siege to Mingary Castle and were so ruthlessly defeated that it led to the destruction of the Clan. 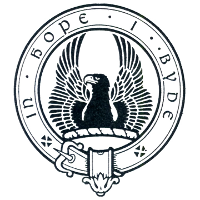 In 1723 the Estate was purchased by Alexander Murray in whose possession it remained until his death in 1743. Charles Edward Stewart landed in Moidart in August 1745. Mingary Castle was held by Donald Campellas, factor of the Duke of Argyll’s Ardnamurchan estate. A small force of Hanoverian troops were sent to Garrison the Castle and by January 1746 there were 59 Officers and men. 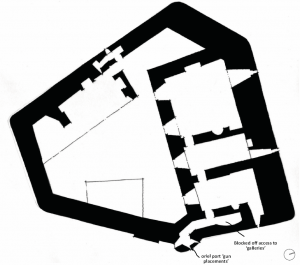 The obvious assumption is that the 18th century building known as the Barrack Block was erected in 1745, but thrown up to house 59 men in less than 6 months! Possible but probable? The idea that the structure is a “Georgian Barrack Block” is further undermined by the knowledge that Donald MacDonald was accused in 1742 of stealing 19 tons of lead from Mingary Castle and transporting it to Canna. Given that Alexander Murray was obviously in terminal illness then, it would seem that the existing buildings had been stripped of their roofs and left to rot. 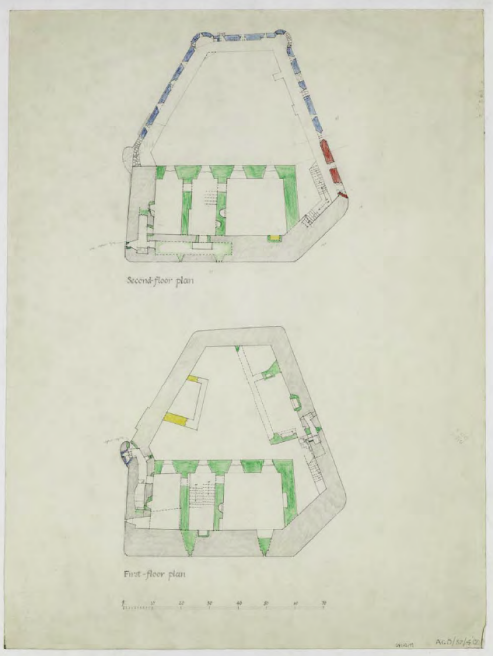 Therefore it is likely that the Garrison force used the existing structure and adapted this to a Barrack Block with the existing block being constructed sometime after 1723 and altered to receive 60 men. 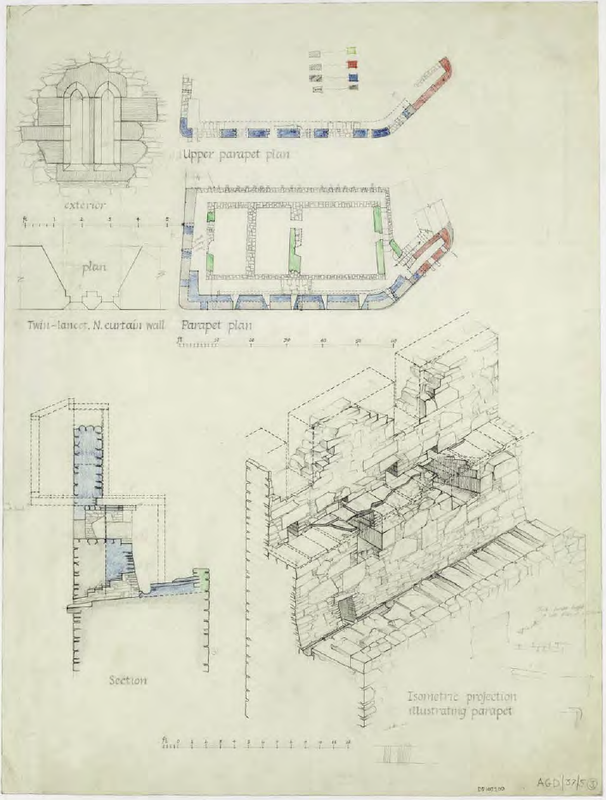 Geoffrey Stell makes comment that the lead work was most likely flashings but a simple calculation reveals that code 6 lead would equate to an area of at least 633 sq m and code 8 an area of 475 sq m, so therefore it is most likely that the early 18th Century Castle block built by Alexander Murray had lead roofs! 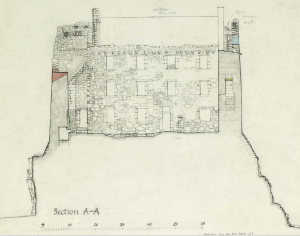 The last phase of building at Mingary Castle in the late 18th Century commenced after the Ardnamurchan estate was acquired by James Riddell in the 1770s. The Castle remained in family ownership until 1848. 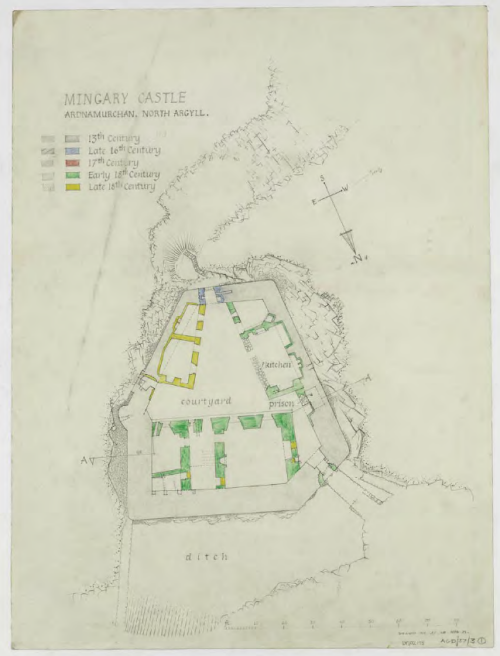 Mingary was still habitable in 1848 and the site was still being used up until recent memory. Mingary Castle has deteriorated over the years with intermittent repairs. The Ardnamurchan Estate was acquired by Mr. Donald Houston in the last twenty years with many buildings on the estate brought back to life to be used either for the estate or tourism.